(December 13, 2007) Photo Gallery Location: Click HERE! We had to eat something. After WWII, severe food scarceness hit people, especially children. 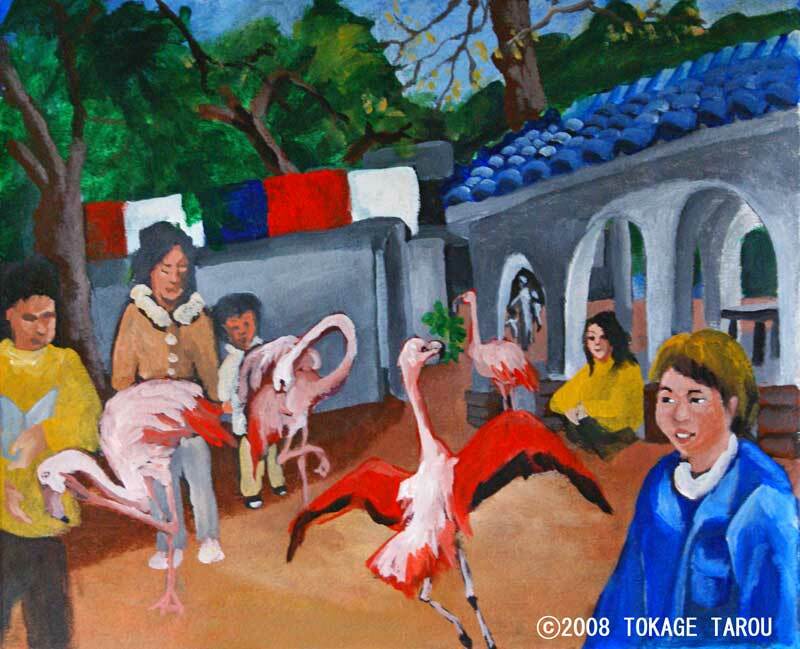 Therefore Mr. Takamasa Ikeda who is founder of the Ikeda Zoo opened farm to save children in 1948. Since Mr. Ikeda loved animals so much, he added more species besides livestocks. Then the farm had eventually transformed to the zoo. 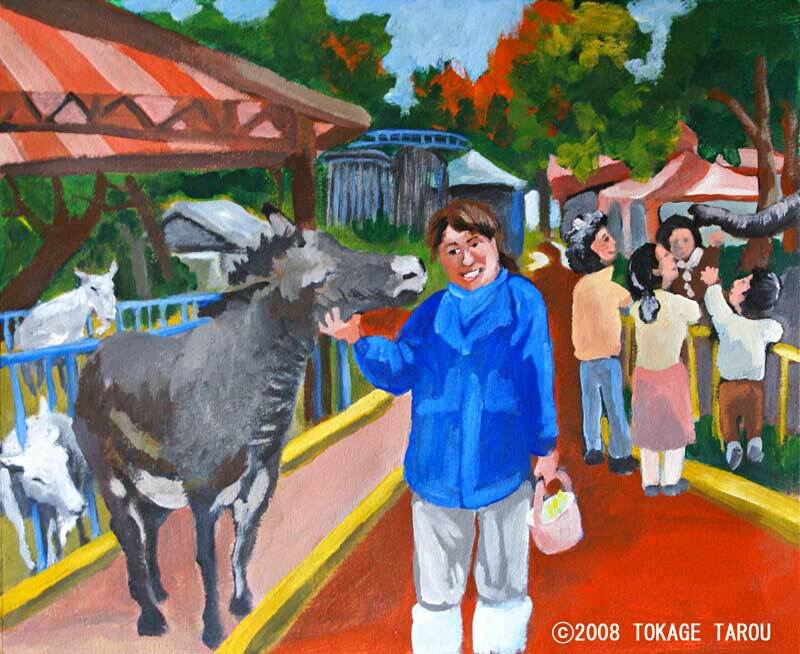 Now Ikeda Zoo is located in the centre of Okayama city by Kyoyama Mountain. 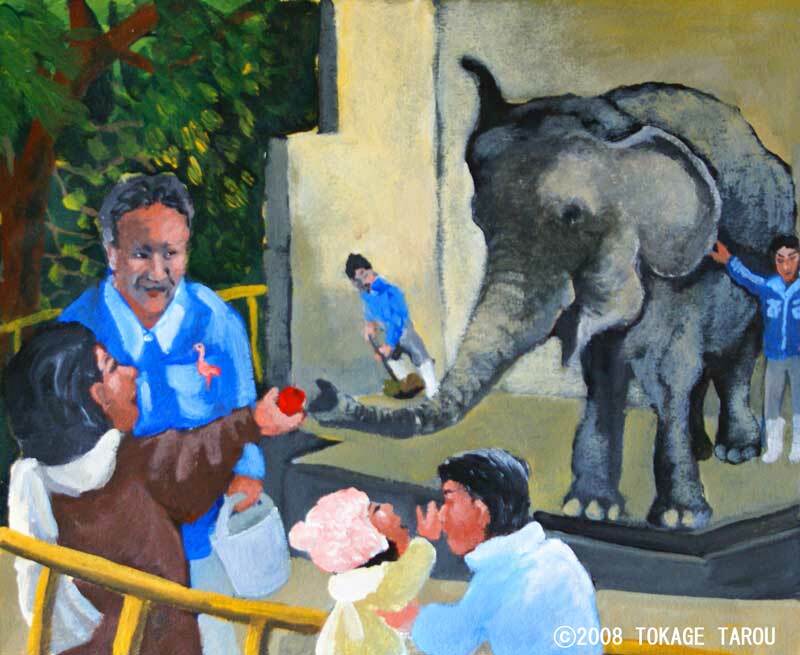 Education is the main purpose of Ikeda Zoo now. He wants all the visitors to have opportunity to interact with animals. In that way, people will know more about animals. For instance the elephants had been fed by the visitors for more than 20 years. One visitor said about nose of the elephant. "Wow!! It is so big yet moves very intricately". They know what I am doing. In a freezing early morning, Natsuki Matsumoto, a zookeeper for small native Japanese mammals, splashed cold water to clean the cage. 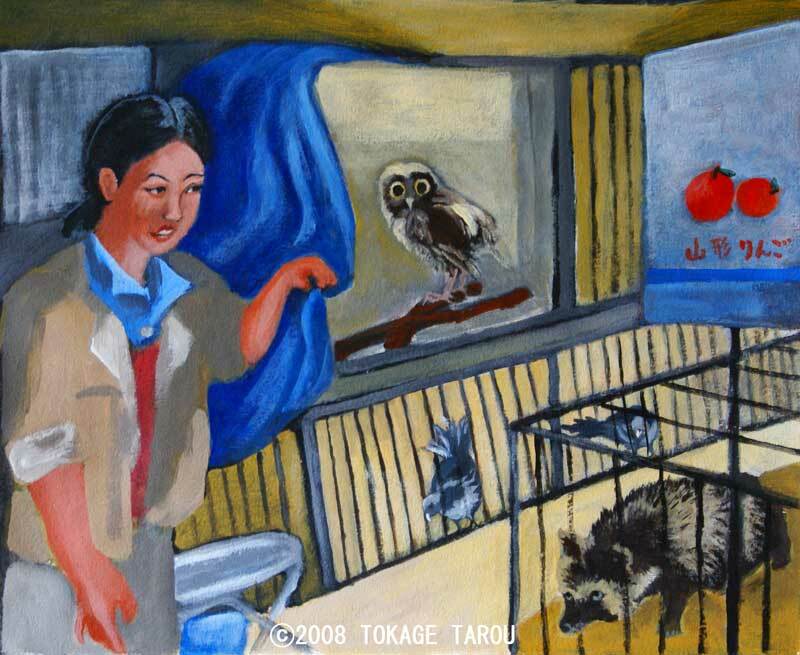 A Japanese Racoon and a Masked Palm Civets are looking at her with their big round eyes. "Please be patient. I will finish soon." It seems that they understand what she is doing and saying. 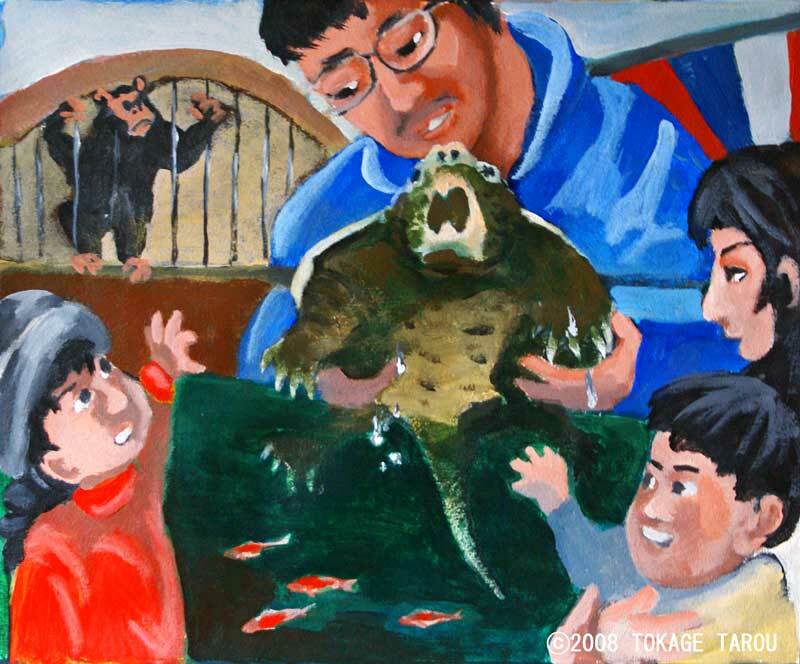 Matsumoto also takes care of other animals in the Kid's Zoo. After cleaning, she feeds the goats and a donkey. "A donkey is a fawner", she said. "While I am giving food to a goat, he will immediately find that and come to get a piece. Here he comes!!" The keys tell them where I am. A male Bengal tiger is roaming and sometimes makes fearsome roar. His name is Ken. "He is still wild and doesn't like humans much, which is good thing though." Takuya Shimizu who gives meat to Ken explains Ken's behaviour. Shimizu works at the big cats and the monkeys area. When he approaches to monkey site, the Southern Pig Tiled Macaque welcomes him. "She is twitching her forehead when she is happy", said Shimizu. "She is always active and wants to play with me. She will soon notice my presence, even I am far away from her. The keys which I bring all the time with me make some noise. Probably that tells her that I am close by." Her neighbours are the Brown Lemurs. Shimizu cuts fruits very finely to keep lemurs busy to pick up a piece. "In that way, strong, weak, old, and young, all of them can get their share without fighting while they are feeding", said Shimizu. The Ruffed Lemurs are mocking a male Silver Baboon next door all the time. 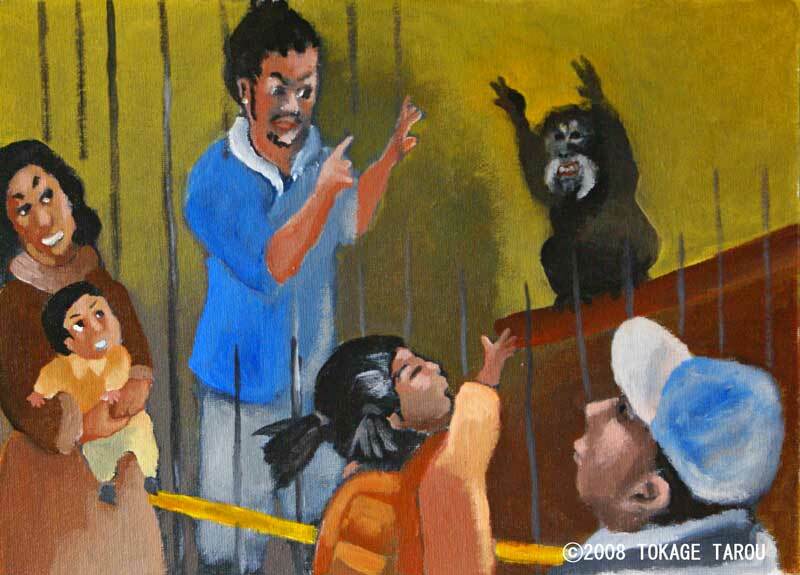 "They knew that the baboon cannot reach to them", said Shimizu. The face of baboon is getting reddish. "His far is sparkling silver, isn't it? That means he is in good shape. They also need energy to get angry", said Shimizu proudly. Ryoichi Akasako has taken care of the elephant for 15 years. When he was assigned to be with the elephant, he knew about elephant only a few. He had to learn bout elephant little by little. "You could not enter the room with out giving a sign to the elephant, otherwise she easily got frightened. She really does not like sudden movement", said Akasako. "They are very intelligent. They never forget things they have experienced. It is not easy to get their trust. We have to know each other gradually. You always have to be patient", said Akasako. Nowadays a new zookeeper needs at least 6 months period of time to get used to the elephant and when a zookeeper approaches the elephant at least 2 people must be with him. Akasako likes watching the visitors feed the elephant feeding time for visitors. Some of visitors keep coming back to the zoo for the elephant. One visitor describes the nose of the elephant, "It was so big and hard, yet moves intricately." By the way, flies which flying all over the elephant's excrement are good meal for frogs. The frogs are very popular among visitors like elephant. Takayuki Asano, senior zookeeper, who has more than 20 years of experience at Ikeda Zoo, still has some difficulties when he is assigned to new faces. "It does not matter whether it is carnivore or herbivore. You have to be very cautious even after you got accepted by animals. They are unpredictable. After all, they are not only classified differently as one species but also different as an individual which has own character", said Asano. For example, there are two Alligator Snapping Turtles in the Zoo. In general, they wait their prey and stay still. Then when the prey comes around in front of them, they quickly swallow it. In contrast, one in Ikeda Zoo is not so patient, he hunts like predator in savannah while the other is waiting. Each of them eats 300 goldfish a week, but the one does hunting gobbles it all quicker than the other. So you have to change the feeding schedule for each of them. In addition that, the thermostat often get broken because the active turtle removes rocks to hunt. Although they have fearsome face, they are very sensitive to environment surround them. Therefore Asano must clean the tank as quickly as possible, otherwise they will be stressed out because of dehydration. "I have to think the layout of those rocks first then begin cleaning", said Asano. 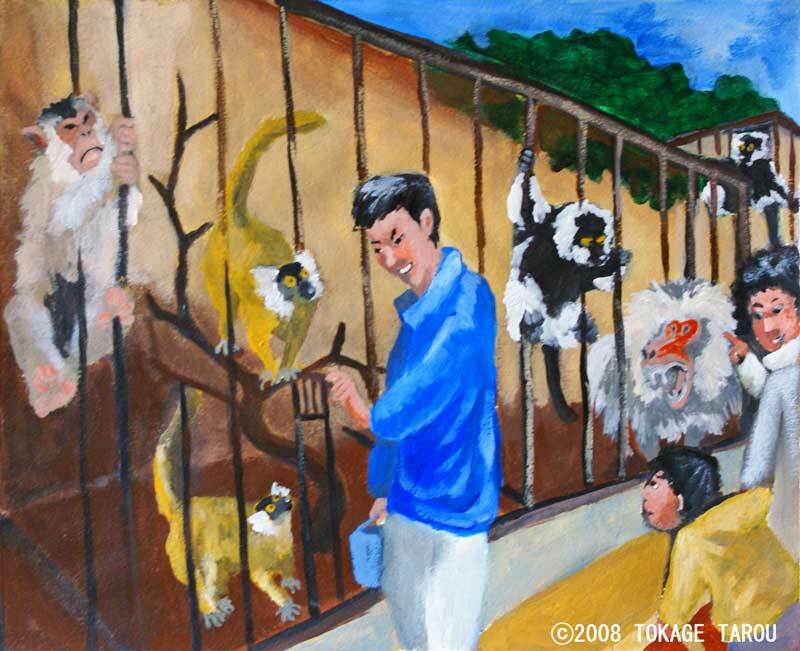 Ashida is the zookeeper for the primate exhibition. When Eri the Crab Eating Macaque hears his whistling, she raises her both arms. Ashida explains about this behaviour. "If one zookeeper had stronger bond with her than I have, she would play with him rather than me. If I have more, it would turn the other way around." Eri is too old to vigorously play around. "But she still has charming big eyes, which attract a lot of people," said Ashida. During a summer, the Striped Japanese Snakes sneaked into the birdcage, ate some eggs of the Chilli Flamingos and receded into the dark at nights. As stealing eggs was getting worse, Ikeda Zoo decided to keep some eggs away from the nest and hatch them out artificially. A zookeeper Hiroko Nakayama was on assignment for this job. After hatching, chicks survived on the nutrition inside of themselves for 10 days. So the real challenge for Nakayama to face was coming after 10 days. Although bathing was very important to get rid of parasites and keep them clean, they could not bath themselves unless she helped them to do even after they stood up. "Since they grew up by human, they don't know how to get used to water. Not only that I have to teach them almost everything in order to survive", said Nakayama. Every weekend the flamingos walk around in the zoo. Sometimes they fly around you. It is good exercise for them to do so and good entertainment for visitors, too. Human is not the enemy. Ikeda Zoo also manages the animal rescue and rehab centre which is entrusted Okayama Prefecture. There are doves, owls, Japanese Raccoons, etc. All of them are injured and found by local people. Wakako Hirano explains about condition of the injured animals. "There are really wild animals and very afraid of people." When she became a wildlife rescuer, that was like dream come true for her. But the reality was another story. One day she was cleaning the legs of an injured bird. The bird suddenly died in her hands. The cause of death was hart attack. Hirano deeply regretted what was happened. I should have known better. The bird was so afraid of human contact. I could not notice how she was terrified by me. I have never forgot the experience," said Hirano. Most of animals which carried into the centre are deeply wounded, so 80% of these animals cannot make it. "Sometimes I feel so helpless but I save one animal at a time anyway", said Hirano. When you find a chic or a cab on the ground, what you should do first is looking around it very carefully because most of the time its parents are nearby. It is common that chics or cabs drop out of their nest accidentally and usually they do have strength to back to their home by themselves.